Today there is a brutal, vicious, worldwide fight going on. It is not between families or clans; not between countries or provinces. It doesn’t centre around political differences or divergent worldviews. It is nothing new; it has been raging for millennia. This fight is between God and Satan, between God’s holy angels and Satan’s evil powers of darkness. This fight involves every human being and every spirit. It cannot be avoided. You and I are also included in this fight. Our first ancestors listened to Satan’s lies and ruined the perfect life that God had planned for us. Because they obeyed Satan, they ended up becoming his slaves and living under his control. Their sin against God opened the way for all kinds of sickness and evil to invade and ruin the beautiful world that God had made. Fortunately, God had compassion for our lost and hopeless lives. He paid a great price by sending his Son, the Lord Jesus Christ, from heaven to come down to this earth. Jesus came to destroy the works of the devil and to bring us back into the family of God. Satan hates this plan and rages with anger. He has tried his best in every way to ruin God’s plan of salvation. Even today, Satan is still at work. Many people are being threatened, deceived, and pulled away from following the Lord Jesus. Being a Christian is not easy. We are involved in spiritual fighting every day. But Jesus set the perfect example, and taught us to be courageous. In his Word, the Bible, he said: “I have told you these things, so that in me you may have peace. In this world you will have trouble. But take heart! I have overcome the world” (John 16:33). 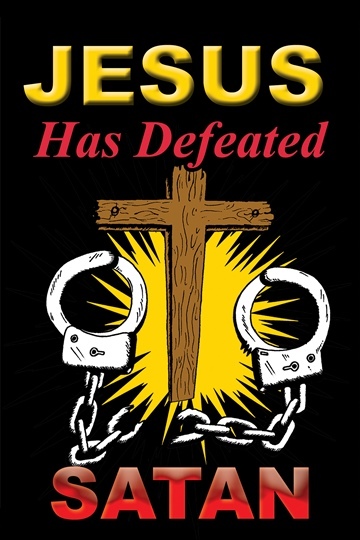 As Christians, we can rejoice in knowing that Jesus has already defeated Satan. If we claim Jesus’ strength, we can gain victory over the sin and evil of this world. Rejoice and live in victory!